Bitcoin and a host of other major cryptocurrencies shed more than 10% over the weekend. The sell-off was sharp, fast, and unexpected given the growing bullish sentiment we’ve seen over the past month. Bitcoin is now trading at a one-week low and market watchers are wondering if the selling is over. The selling might not be over but, based on the outlook for the cryptocurrency, I’d welcome another dip. It will be my chance to buy some more cryptocurrency. The weekend sell-off was for sure a surprise, it definitely wiped a chunk of value out of the market, but I wouldn’t be too concerned about it just yet. 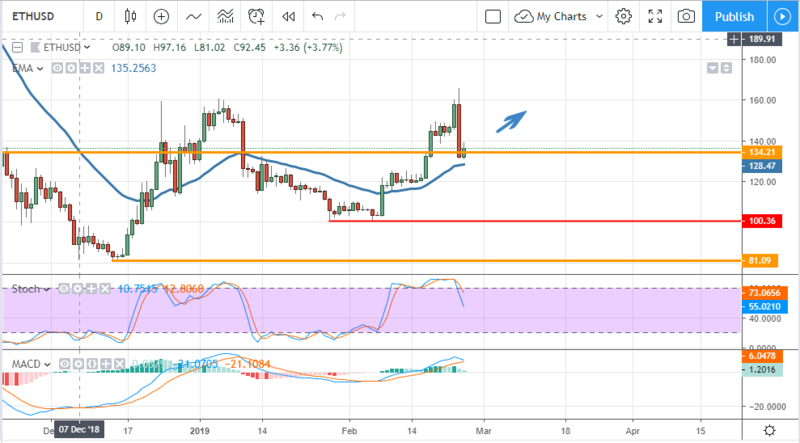 The move occurred as BTC was hitting a technical resistance level and after a substantial move higher so is most likely profit-taking than anything else. 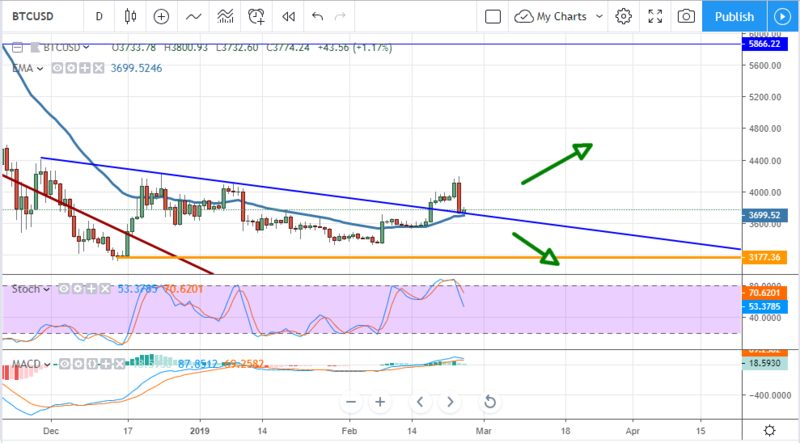 BTC is now sitting on a key support target, near $3,700 and coincident with the short-term moving average and a trend-line, so downward pressure looks halted, at least for now. A move below the EMA would be near-term bearish with a target of $3,177. A move up from here would confirm support, the new uptrend, and likely lead BTC back to $4,200 or higher. Ethereum, the most advanced cryptocurrency in theory, was not immune to the sell-off. The token fell nearly -20% in a matter of minutes giving up more than a week of gains. The move was able to find support near $130 and above the short-term EMA so there is some hope for the bulls; the sell-off was profit-taking, the newly forming bull market is still intact. A move lower may take the token down to $128 or $120 but I don’t expect a deeper move than that. A move up would confirm support and the uptrend, my targets are $160 and $180. 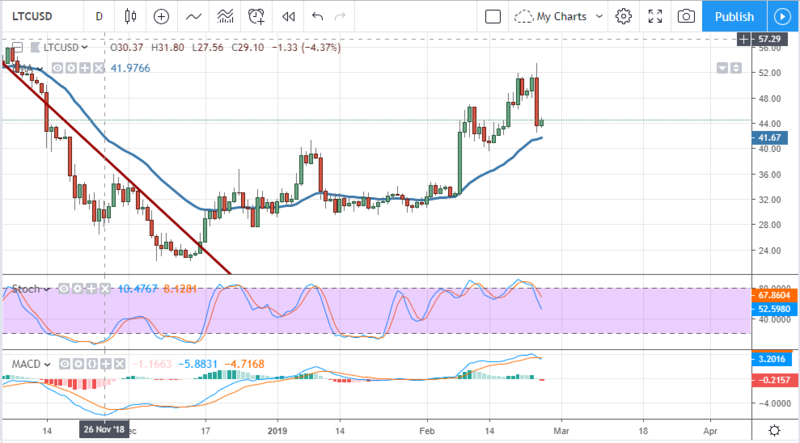 Litecoin also fell nearly -20% over the weekend and is also sitting above support targets at the short-term EMA. The liter version of BTC is still in an uptrend and looks like it will move higher and probably fairly soon. The indicators are bearish so another test of support is possible, maybe as low as $40, but upward movement is expected for the short to long-term. A move up from this level would confirm support and likely take the token up to $52 and $56. 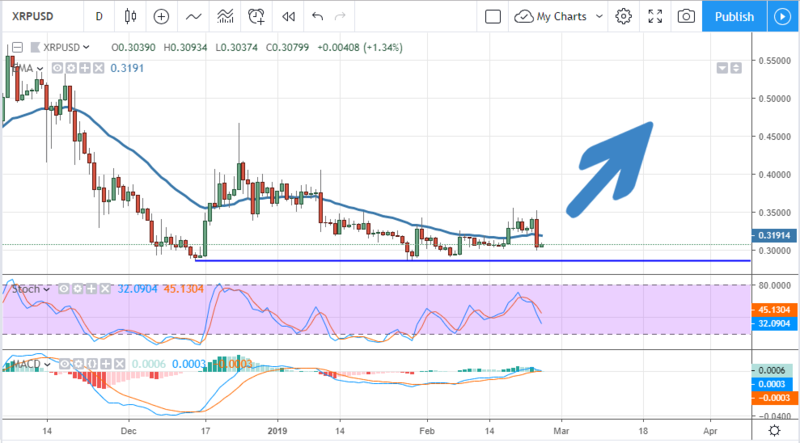 Ripple shed about -16% on Sunday and is now trading at a key support level. This level is near $0.30 and the level at which a major bottom is forming. The indicators are consistent with a test of support but do not indicate a price reversal so I expect support will hold now. A move lower may test $0.28650, a break below there would be bearish. A move up would be bullish and confirm support, my target would be $.350 and $0.40.